This has happened before and I’m sure this will happen again. Wondering what it is? Well, it is Hubby dear volunteering to do some grocery shopping on my busy day. He goes off and returns back an hour and half later which would have normally taken me just half hour minus half the things mentioned by me plus a load of things quite not necessary at all. One of his impulsive purchases was a popular brand of oats cookies. One bite and he started complaining that it tasted like saw dust. My kids too refused to have them siding with their father. I had to agree with him on that aspect. It did taste well… not like saw dust but quite tasteless and bland. What more can you expect in cookies manufactured specifically for Dieters? Hubby dear’s argument is that just because a person is dieting it doesn’t mean that the food has to be tasteless and bland. Well I agree with him on that too. So I volunteered to bake the same cookies but quite the opposite of his purchase to which the children readily agreed and had a wonderful time in helping me to bake them. Preheat the oven at 180 Degrees. Prepare a baking tray by applying butter and dusting it with flour. Prepare Dry Ingredients: Sieve All purpose flour and baking powder together. Powder the oats coarsely and add it to the flour mix and keep it aside. Prepare Wet Ingredients: Cream butter and sugar together. Add vanilla essence and beaten egg to this and mix well. Start mixing the dry ingredients with the wet ingredients little by little and mix into soft dough. If dry add milk little by little to make dough. Drop the dough with a spoon onto the greased plate leaving enough space between them and bake at 180 Degrees for 15 mins. I baked in 2 batches. In the 1st batch the dough was a little loose so it took me 20 mins. For the 2nd batch I sprinkled some more flour to the dough to get a firm consistency and got them baked in 15 mins. The Next time I’m planning to reduce the sugar qty as Hubby found it too sweet for his taste. But it was OK for the kids. looks very nice & healthy cookies!! Delicious cookies … Love to have a bite. So,coz of curcumstances you attempted this.So cute of you and it has come out so perfect Radhika.With that cup of tea no one is goin to keep distance..
cookies look crunchy good and gee the impulsive purchase by ur spouses with half of the thing not needed made me lol- happens all the times at my place ! Looks yum and lovely tea time snack. Yum yum, scrumptious healthy cookies..fabulous! It’s the same case in my house too…Those cookies look very healthy and tastier too! 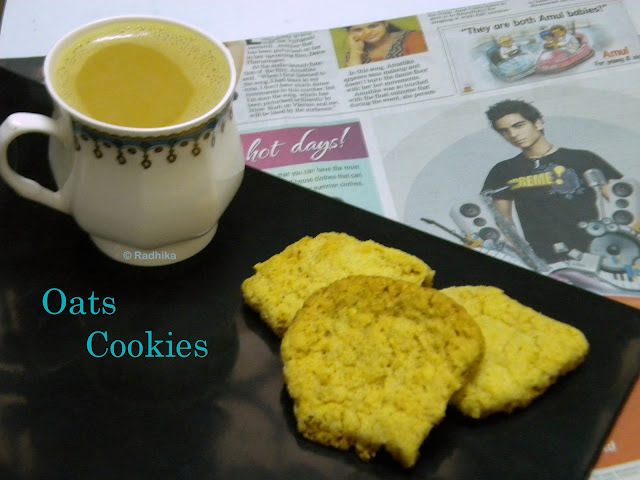 Crispy and healthy cookies,perfect with a cup of tea. 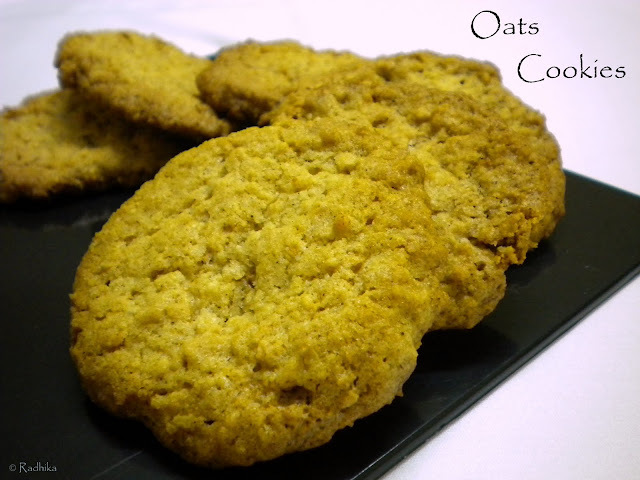 Absolutely crispy and yummy..Looks perfect for tea time..
Hi, oats in cookies are a great way to add oats in our diet and the cookies look ready to be grabbed. Homemade are always the best! Your cookies looks wonderful! Have a lovely weekend! 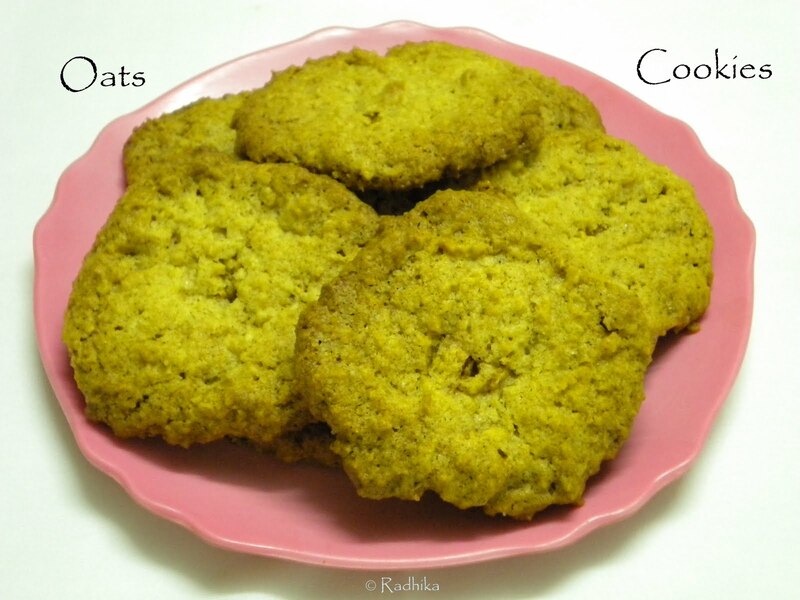 healthy oats cookies..looks crunchy too!! 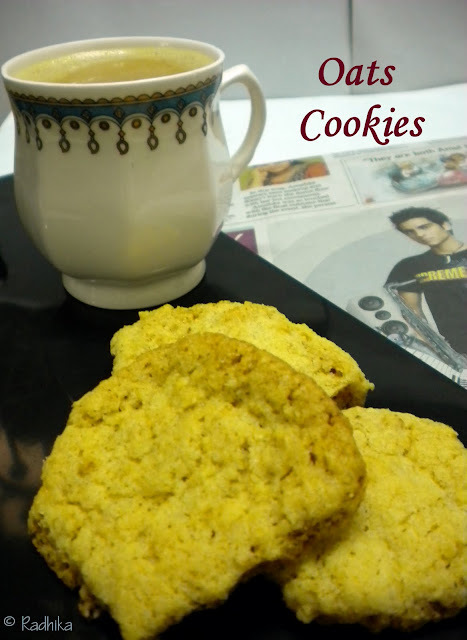 Love these cookies ..perfect to crave tea time hunger. is it possible to give the measurements in cups? I would love to try these cookies at home. Perfect and yummy accompaniment for the tea! Nothing beats the home-made goodies with love..
🙂 .. love the oats cookies Radhika. wow..Looks so soft and tempting.. So good.. Just perfect with warm milk.. These cookies are perfect. Can you give the measurements in cups? I would like to try the same at home…. 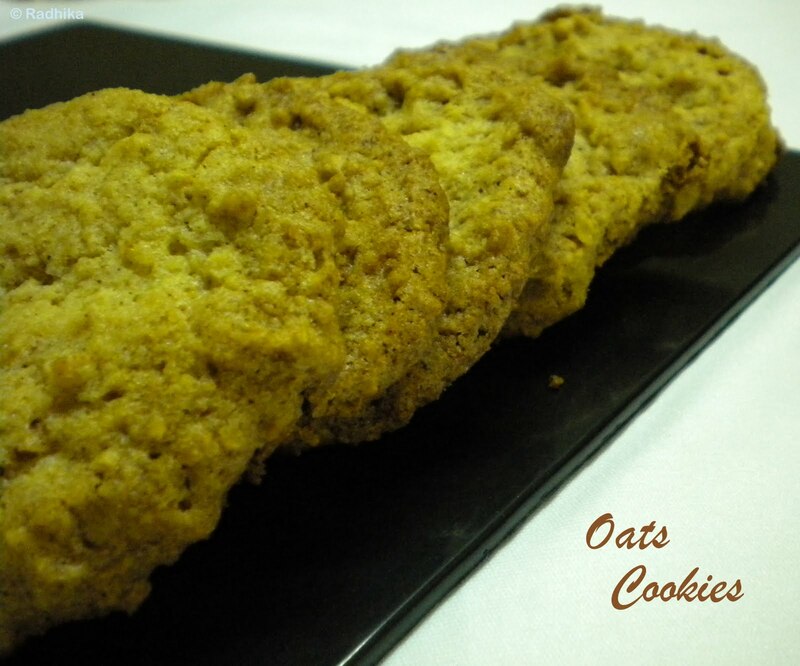 Hey, Oats, flour and butter – 1 cup each and sugar – 1+1/2 cups. Hope it works out well for you.